If you have operated a business in the Chicago area for any length of time, then you probably know Chicago Industrial Equipment is your best source for reliable aerial lift platforms and other lift equipment. However, you might not know that we also offer an extensive selection of dirt equipment for all types of earthmoving applications. Whether your business is construction, agriculture, quarry and mining, forestry or any other operation that requires tough, durable earthmoving machines, you will find the ideal equipment at a competitive price right here! 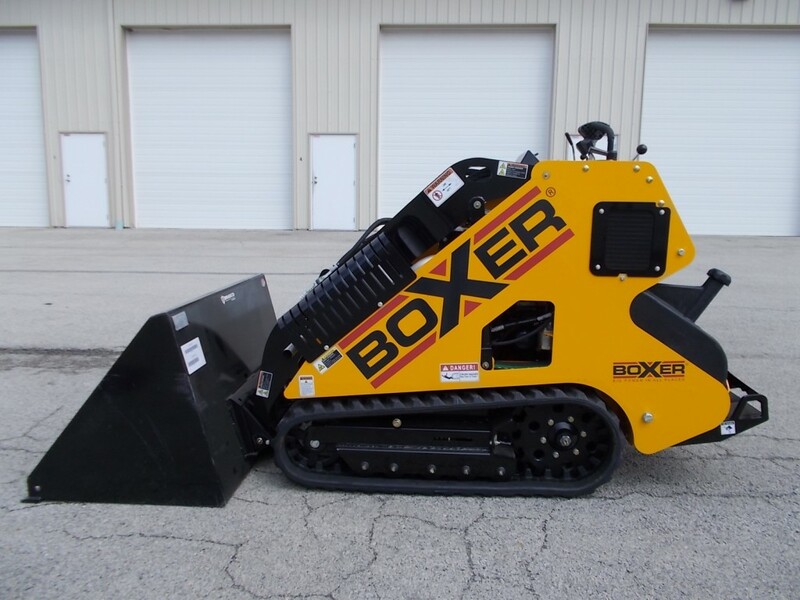 We offer high-performing new and used dirt equipment from Boxer, a leading manufacturer of lightweight, yet brawny and rugged machines featuring a remarkable amount of hydraulic lifting power. Boxer machines will enable you to dig and transport materials with greater speed and efficiency. Boxer compact utility loaders and trenchers are a preferred choice of landscapers, irrigation contractors, plumbers and anyone else who needs a hardworking, dependable machine for trenching, digging, tilling and much more. Boxer 100 Trencher Series: The Boxer 100 Trencher Series includes the Boxer 120 Dedicated Trencher, a compact, gasoline-fueled trencher. The world’s only ride-on trencher, the 120 delivers an impressive torque output of 740 pound-feet, providing ample power for your most demanding digging applications. It also includes an ergonomically designed operator station featuring highly accessible controls for easy two-handed operation. The ride-on design also increases visibility, enabling safer, more efficient and productive operation. Boxer 300 Compact Utility Loader Series: The selection of new Boxer skid loaders includes the 300 Compact Utility Loader Series that offers excellent balance and stability, superior ground speed and easy-to-use controls, all in one compact but efficient package. The 320 features a high-performing 20.5 horsepower Kohler gas engine that provides remarkable fuel efficiency and a surprisingly large 438-pound load capacity. The larger 322D gives you an additional 1.5 horsepower and can accommodate loads of up to 464 pounds. Boxer 500 Compact Utility Loader Series: Our collection of new Boxer skid loaders also includes the 500 Series that provides the additional power for more heavy-duty lifting and loading applications. The specially designed hydraulic crawl valve, a feature that is unique to the 500 Series, enables you to deliver peak hydraulic performance exactly where you need it. Choose from two 500 Series models: the 525DX with a 24.8 horsepower Kubota diesel engine and a 735-poundload capacity, and the 532DX with a powerful 32 horsepower engine and a 1,050-pound load capacity. Boxer 900 Compact Utility Loader Series: The Boxer 900 Series features the most technologically advanced mini-skid steers on the market. The 950HD is a 48-horsepower beast equipped with a powerful, yet efficient Tier 4 Final Isuzu diesel engine. It also has a spring-cushioned operator platform that combines advanced ergonomics with enhanced attachment visibility to increase operator comfort and productivity. Rubber tracks provide superior traction while minimizing ground disturbance during operation. Our selection of top-quality used Boxer equipment gives you a great way to cut equipment costs without cutting corners. Depending on availability, options can include late model, low-hour used Boxer skid loaders and used Boxer trenchers, many of which contain the most recent Boxer technological innovations. You will get a machine that will increase your productivity at a price that is thousands of dollars less than a brand-new model. You may also find older, value-priced, used Boxer loaders and trenchers that still have much to offer to a new owner. Many Chicago Industrial customers find that purchasing used equipment is a much more cost-effective alternative than renting machines on a frequent basis. Additionally, the fact that all of our used equipment is painstakingly refurbished to like-new condition ensures you are getting a reliable loader or trencher that will deliver dependable long-term performance. You will surely appreciate the fact that purchasing used heavy equipment instead of new frees up additional capital you can devote to other areas of your enterprise. If you have been burned in the past when purchasing used heavy equipment that doesn’t live up to your expectations, you are in for a pleasant surprise at Chicago Industrial. In addition to restoring our equipment to like-new condition, we also provide our customers with all the information they need to make an intelligent buying decision. You get access to detailed product descriptions that are chock-full of specs and other relevant data. You can always count on our expert used equipment sales staff to steer you in the right direction. If yours is like most companies, you don’t necessarily have the cash on hand to handle the entire cost of heavy equipment. At Chicago Industrial, we offer a number of flexible financing options that enable you to pay for your used or new Boxer equipment over time. We work closely with Direct Capital, a reputable small- and mid-size business lender, to help our customers secure financing arrangements that fit their needs and budget. Get instant access to amounts of up to $100,000 with no financials required. Freight costs can often be prohibitive these days – unless you purchase your heavy equipment from Chicago Industrial. Our centralized Midwest location helps minimize shipping costs throughout the United States. We also work with a variety of top-notch commercial carriers to obtain the best possible freight rates for our customers. If you are looking for superior skid steer loaders or trenchers at budget-friendly prices, get started by exploring our current online inventory. If you’re in or near the Rockford, Illinois, area, feel free to stop by our expansive 10-acre yard and 50,000-square-foot facility for a closer look.